Cubs fans, rejoice! This may be the year you can finally stop blaming a goat for all your problems and win a World Series. Without a doubt, sports are a goldmine of economic topics. With the popularity of books and movies like Moneyball: The Art of Winning and Unfair Game, many people have been exposed to how the logic and mathematical tools of economics are readily applied to sports. In my honors principles classes, I ask my students to write op-eds of their choosing, with the condition that they apply the economic way of thinking to their topics. Without fail, at least one paper turned in will be about baseball, basketball, soccer, or football. The most recent World Series is bringing up a different type of economic problem, however. 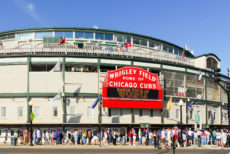 It’s reported that bars near Wrigley Field are charging some $250 per person just to get inside to watch the Cubs play in the World Series. These prices include drinks and a buffet, but not a seat. A chair is an additional charge. To get a table for four at some of these bars, you can plan on shelling out an extra $500. At one bar, $1,000 will get you a table for six, beer, wine, food, a bottle of Grey Goose and a bottle of champagne. I was outraged at this apparent monopoly situation that was occurring before us....[Fans] will be prevented from participating in the historical moment...when the Cubs end their 100-plus year championship drought. This type of reaction is common to a sudden increase in price. Economist Gregory Mankiw was recently blasted by critics, for example, when he praised the $2,500 ticket price for the Broadway show Hamilton. But it’s not just the prices of entertainment that tend to draw fire from critics. After practically every natural disaster (hurricanes, tornados, floods, etc. ), stores are often accused of “gouging customers” by raising their prices. The outrage comes from people feeling as though consumers are being taken advantage of when prices rise. But this way of thinking illustrates a fundamental misunderstanding of economics and the role of prices. Prices serve a couple of functions. First, prices reflect value. They allow buyers and sellers to economize on information but still know what a good is worth. Take, for example, a simple good like oranges. Suppose oranges are $1.00/pound one week and $5.00/pound the next week. There are many reasons why the price may have increased, some having to do with the supply of oranges and others with the demand. The neat thing about prices is that we don’t have to know anything about why the price changed at all! What we do know, as a result of the price increase, however, is that oranges are more valuable, more scare than they were before. The second function of prices is that they serve as incentives—to producers and consumers. In our orange example, a higher price incentivizes consumers to buy fewer oranges. Seeing the higher price, they choose another fruit instead. For producers, a higher price gives them the incentive to produce more oranges, as they can fetch a higher price. Taken together, these two functions work to channel resources to their highest valued use. In the case of a price increase for oranges, for example, those who don’t highly value the oranges won’t buy them. They will be deterred by the higher price, leaving the oranges for those who place a higher value on the fruit. (We know they value them more because they are willing and able to pay the higher price.) At the same time, producers, seeing they can claim a higher price for oranges, will work to supply more. This works to make more oranges available to more consumers. This same process is exactly what’s happening in the market for seats at bars during the Cubs games. In this case, the demand for seats is putting upward pressure on the price of tables at bars. When demand for a good increases, economics teachers us that the price will naturally rise. The effect of this price increase works exactly the same was as it does in the market for oranges! The high price deters those who value the bar seats comparatively less from using them, leaving them available for those who are really serious about watching the Cubs in bars close to the field (i.e. those who are willing to pay the higher price). For producers of these seats, you can bet every table near Wrigley field will be crammed to capacity. Bar owners will fit people and chairs wherever they can in an effort to increase supply and satisfy as many customers as possible. Whether we’re discussing oranges, the price of tickets for a Broadway musical, or the cover charge at a bar, it’s important for us to remember the important role prices play in helping to channel resources to those who value them the most. While we may not like it when the price of things we want to buy increases, the hesitation we feel in buying something that’s now 30% more expensive, or even the decision not to purchase at all, is the price system doing it’s job. So relax, Cubs fans, and enjoy the game. Maybe buy Billy the Goat a beer or two?